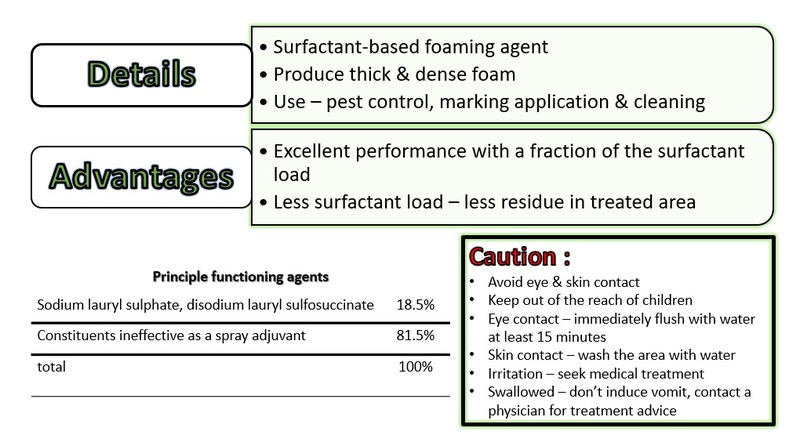 X Foam Pro is a surfactant-based foaming agent specifically designed to produce thick, dense foam with good body for a variety of pest control, marking application and cleaning. Extended foam duration make X Foam Pro the best choice when result matter. This proprietary formula provides excellent performance with a fraction of the surfactant load compare to other foaming agents designed for similar uses. Less surfactant load leaves less residue in treated areas and the environment. Caution: Avoid eye and skin contact. Keep out of the reach of children. In case of eye contact, immediately flush with water at least 15 minutes. In case of skin contact , wash the area with water. If any irritation persist, seek medical treatment. If swallowed, do not induce vomiting, contact a physician for treatment advice.